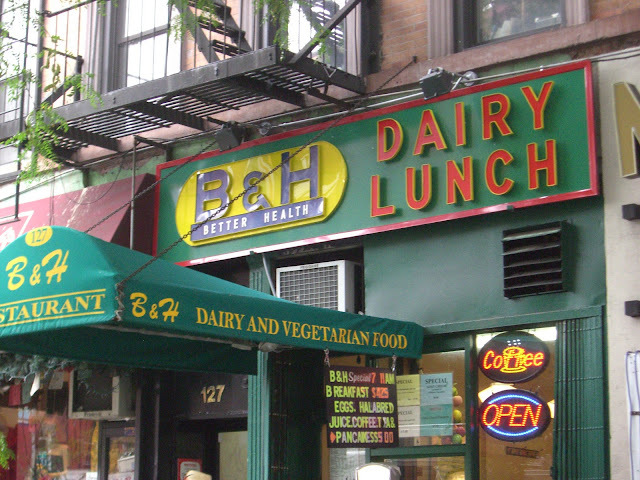 I don't think the interior of this tiny East Village restaurant has changed since the 1970s, I don't think the menu has been updated much either, which is likely a big part of it's appeal. For lunch, particularly on a cold, rainy day there is nothing better than a bowl of B+H's hot borscht soup (cold in the summer!) with toasted, buttered challah bread. The check usually comes to around $5. That actually doesn't sound bad for bills around $5. A view of the interior as well as some of the dishes would be greatly appreciated.